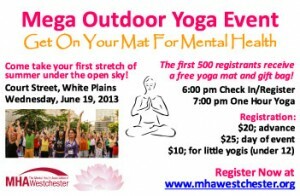 Westchester Mega Outdoor Yoga Event! GET ON YOUR MAT FOR MENTAL HEALTH! Take your first breath of summer under the open sky and roll out your mat with hundreds of yogis! All ages and levels welcome! Live music, healthy food, and exhibit displays. First 500 participants receive free yoga mat and gift bag.